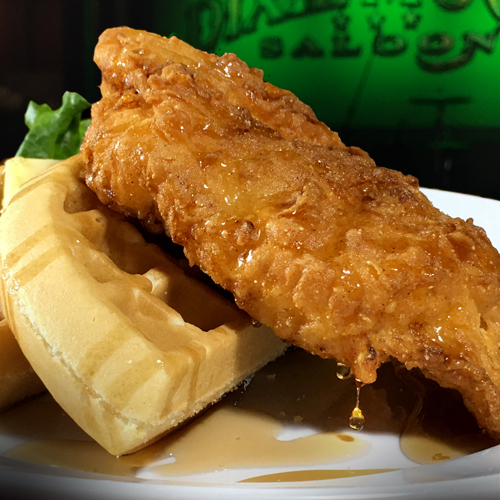 The Dixie Moon Saloon is pleased to present a carefully-crafted menu that combines Southern flavors with distinctively modern tastes. Savory dinners, satisfying handhelds, salads, appetizers, and more. Order in or carry out today! Got an event to cater? We've got you covered! Email Dixiemoonsaloon@gmail.com or call (248) 850-7075 to start planning your event's dining experience. Start your meal with some down-home flavors you won't soon forget! Smoked buffalo chicken mixed with cream cheese, fresh jalapenos, and pecan-smoked bacon, breaded, flash-fried, and served with Dixie Dipping Sauce. Lump crab, shrimp, andouille sausage, peppers, onion, celery, and seasonings, folded in our house batter, deep fried golden-brown, and served with Jezebel Jelly on the side. Lightly-battered, hand-cut to order pickle chips, flash-fried and served with our chipotle-ranch dip. Traditional New York-style chicken wings, tossed in your choice of hot sauce or Austin's Own BBQ Sauce, and served with a side of bleu cheese dressing. Panko-breaded, fried crisp, served with a siracha goat cheese spread and pesto aioli. Our thick and juicy burgers are cooked to order, featuring your choice of our house sirloin or house turkey blend. Each burger comes with house-made seasoned chips and a pickle spear. Substitute slaw, fries, onion rings, or sweet potato fries for $2 extra. 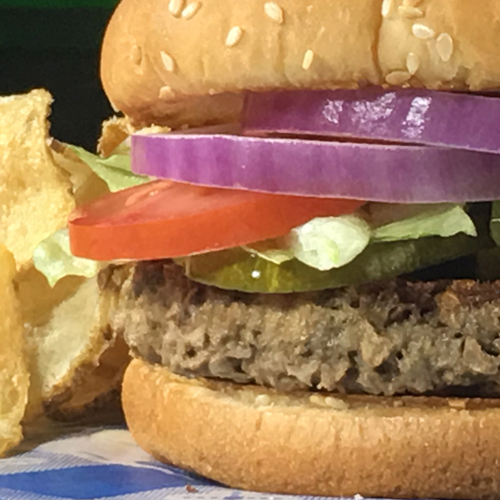 Dixie Moon's custom house sirloin blend is piled-high with shredded lettuce, tomato, onion, pickle, and mayo on a grilled sesame seed bun. Char-grilled burger topped with crisp pecan-smoked bacon, fried sweet onions, mild cheddar cheese, and smothered with Austin's Own BBQ Sauce on a brioche bun. Char-grilled burger topped with sweet and tangy cherry peppers, shredded lettuce, jalapeno jack cheese, and our Southwestern Sauce on a brioche bun. Flat-top Impossible vegan patty is served with shredded lettuce, tomato, onion, pickle, and vegan mayo on our grilled sesame seed bun. Our delicious handhelds are served with house-made seasoned chips and a pickle spear. Substitute slaw, fries, onion rings, or sweet potato fries for $2 extra. Buttermilk fried chicken breast with cheddar cheese, arugula, and maple mustard on a made-to-order waffle. House-smoked and hand-pulled pork, cheddar cheese, and coleslaw, smothered in Austin's Own BBQ Sauce, and served on a brioche bun. Thick-cut pecan-smoked bacon, fried green tomatoes, pesto aioli, lettuce, and fresh tomato on grilled challah bread. Slow-roasted, BBQ-glazed corned beef with coleslaw, swiss cheese, and russian dressing on grilled marble rye. Sliced grilled chicken breast, lettuce, tomato, pecan-smoked bacon, cheddar cheese, and avocado, all wrapped in a flour tortilla. Sliced grilled chicken breast, romaine lettuce, tomato, red onion, parmesan cheese, and Caesar dressing, all wrapped in a flour tortilla. Fresh from the farm to your table! Add a tender grilled chicken breast for $3, fresh shrimp for $5, or a flaky salmon filet for $5. Artisan romaine lettuce, crispy chick peas, shaved parmesan cheese, tomato, egg, and croutons tossed with house-made Caesar dressing. Baby arugula, roasted beets, poached apples, cayenne-spiked candied pecans, and goat cheese served with apple cider vinaigrette. Living lettuce blend, grilled chicken breast, egg, pecan-smoked bacon, carrot, cucumber, tomato, onion, and feta cheese served with ranch dressing. Living lettuce blend, dried Michigan cherries, tomato, onion, and crumbled bleu cheese served with raspberry walnut-dressing. These southern meal classics are sure to satisfy! Add a side salad with your choice of dressing or a cup of creamy slaw for just $2. Cracker-crusted Savannah style lump crab cakes served with smashed redskin potatoes, seasonal vegetable, and finished with a remoulade sauce. Eight-ounce Norwegian salmon fillet, char-grilled and glazed with our house-made bourbon sauce, served with wild rice and seasonal vegetable. 12oz NY strip steak, char-grilled to your liking and served with smashed redskin potatoes and seasonal vegetable. Buttermilk-battered chicken breast, fried crisp, drizzled with honey, and served with smashed redskin potatoes and seasonal vegetable. House blend of cheese, cavatappi pasta, topped with our smoked BBQ pulled pork and a crisp panko crust. Two thick-cut slices of our house made blend of pork and beef meatloaf, served over a pile of smashed redskin potatoes and smothered in brown gravy with a side of seasonal vegetable. Hand-tossed and baked fresh to order. Extra toppings available. Smoked pulled pork, carved ham, smoked gouda cheese sauce, swiss and mozzarella cheese blend, and dill pickle drizzled with our mustard BBQ sauce. Fresh grilled vegetables, mozzarella, and shaved parmesan with florentine sauce. A classic! Savory pepperoni, gooey mozzarella cheese, tangy red sauce, and a roasted-garlic butter crust. Pulled grilled chicken smothered in Austin's Own BBQ Sauce, alfredo sauce, a blend of mozzarella and cheddar cheese, red onion, pecan-smoked bacon, and cherry peppers. Compliment any of our delicious sandwiches, dinners, or pizzas with one of our tasty home-cooked sides. Whole redskin potatoes deliciously blended with cream, butter, and our special southern pride seasonings. Nature's latest served al dente and southern-seasoned. Flash-fried to order with tangy spices. Creamy slaw with crisp cabbage, fresh carrots, and our special seasonings. Thick-cut, beer-battered, and fried to order. Classic fries flash-fried and seasoned to order. Creamy house-blend of cheese with cavatappi pasta, panko topping, and scallions. Living lettuce, tomato, onion, carrot, and cucumber, with your choice of dressing on the side. We've got your favorite non-alcoholic beverages. Looking for something a bit more potent? Visit our Craft Cocktails & Whiskey page for a selection.